On this page I will talk about the obstacles an attacker of a medieval Irish castle would have to overcome before being able to claim victory. Join me on his (or perhaps her?) journey through the Norman Tower House Castle at Claregalway. Back in medieval times, the castles in Ireland were the centres of constant conflict amidst shifting allegiances between landowning families and clans. Battles and warfare were very commonplace. Defensive narrow stairway at the castle, hold on to the rope for your life! Therefore, like all Norman tower houses, Claregalway Castle was built as a fortress. It was surrounded by 18 foot defensive walls and the Clare River came right up to the castle wall making attacks difficult. The design of Claregalway Castle makes it very clear that a formidable medieval Tower House Castle had to be taken inch by inch. Windows were kept very small in the medieval castles in Ireland, and this is true also for Claregalway as you can see on the photo above. Why were windows kept small, you ask? A typical attack in medieval siege warfare involved attempts to mount the castle with ladders as tall as 30 feet. Therefore, any windows you see which are bigger- as in those big enough to fit a person, will typically be an addition from a later era. The tiny medieval windows doubled as arrows loops, providing easy access for defending archers, and creating the first major obstacle for attackers: how to get close to the keep under the onslaught of arrows. At the entrance of the keep, attackers would have to overcome a portcullis, then a heavy wooden door. 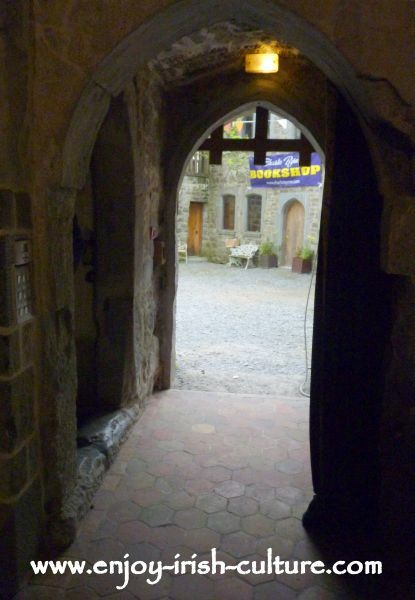 See the entrance to the castle on the photo below. How to get through? 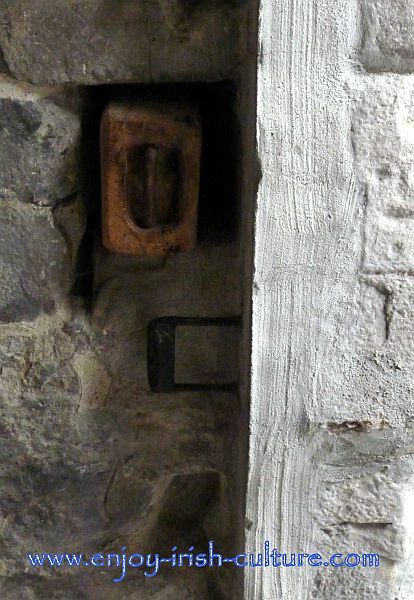 One of the archaeological finds at Claregalway Castle was cracking of the wood at the entrance door showing that it had been burnt. Through finds like these, archaeologists have learned that attempts to set fire to the main door were a viable form of attack. A group of attackers would shelter under shields or under a thick cover of animal skins against the onslaught of arrows, hot liquids and rocks from the machicolations and battlements above, and would make their way to the castle door under this cover. Once in position, they would start a fire trying to burn their way in. They might combine the fire method with the use of a battering ram when the door would begin to weaken. Inside the main door was the murdering hole- providing an ongoing feed of rocks and hot liquids and other hazardous items thrown down on attackers from above. A difficult obstacle to deal with, and you had to get through if you wanted to get anywhere inside the castle. Shields might help, or, again, a cover of thick animal skins- combined with a fistful of good luck that is. If an attacker was able to enter the ground floor vaulted room, his work had only begun. The ground floor contained storage, and plenty of defenders would be sent down here, while the important residents were kept safe in the residential halls higher up. The most important people lived at the very top of the tower house castle. 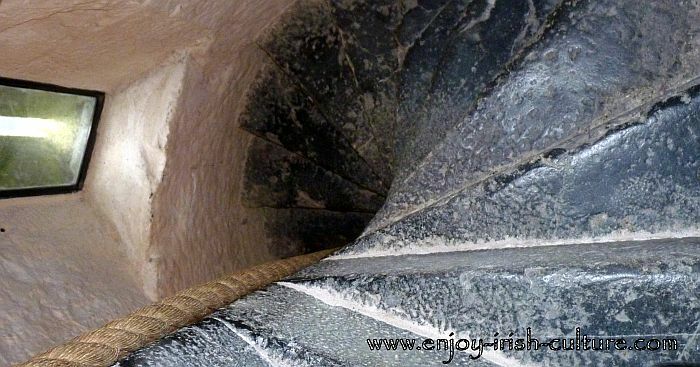 Leading up to there was a defensive spiral staircase that was designed for right handed defenders to swing the sword on the outside of the staircase, while making life difficult for right-handed attackers facing upwards whose sword would be trapped on the inside of the staircase. See the staircase on the photo at the top of this page. 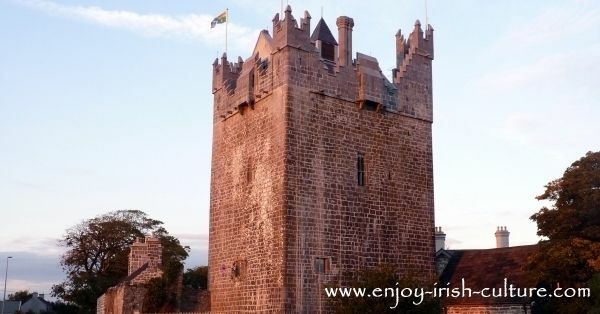 If attackers made it up onto the first floor of this Irish castle, they’d be met by defenders in the fighting gallery. 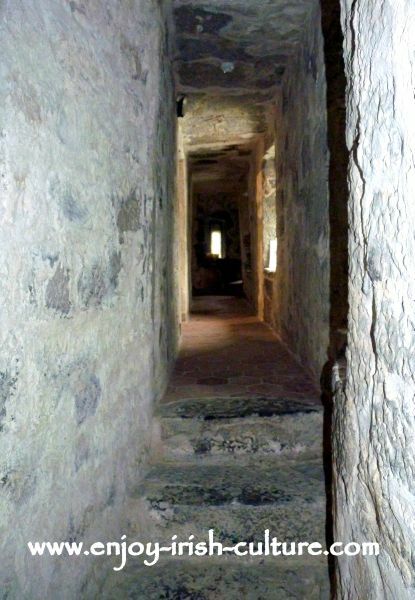 The fighting gallery is a narrow hallway alongside the residential and great halls designed to contain the fighting outside of the living areas and keeping residents safe behind securely shut heavy doors. Fighting galleries created a buffer zone and another chance to overcome attackers who would be at a disadvantage not knowing the castle’s internal layout, or where the inbuilt ‘stumble steps’ were which were meant to trip them up. The fighting gallery is narrow and awkward to move around in when you are swinging a big sword. The big residential hall is behind the wall to the left. But even if an attacker did overcome all those obstacles and made it into one of the residential halls, a lot more fighting had to be done yet before they could claim victory. Victory would likely come at a high expense. That is, unless you could frighten your opponent into surrendering. Which you might if you had superior weaponry, as happened to John Burke who had taken the Irish Castle at Claregalway by force in 1571. 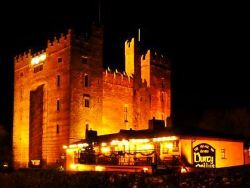 His siege was ended by the threatened use of assault guns especially brought in from Limerick, and he paid dearly for attempting to take charge of the castle. 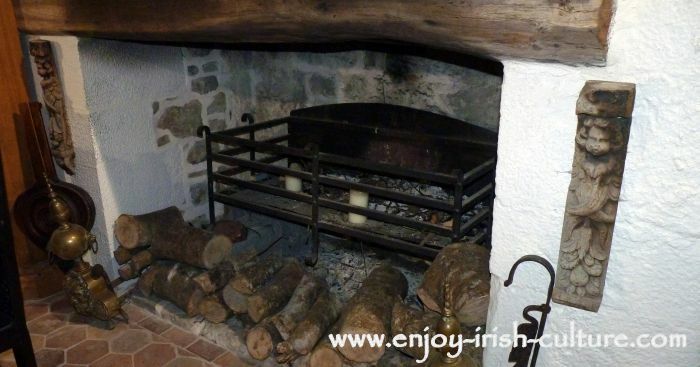 Find out about the bloody history of Claregalway Castle, and find visitor information here. We hope you got a lot out of this article on attacking a castle! If you like what we do on this website, please spread the word to your friends so that more people can find and enjoy our content.